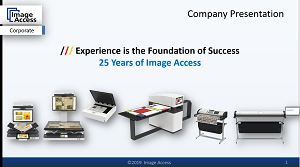 Founded in 1994, Image Access is a technology market leader developing and delivering innovative large format scanners and digitization solutions to customers based in nearly every country across the globe. Image Access scanners produce the highest quality image output at the fastest speed available in the large format market. We are committed to providing products with a focus on ecology and sustainability by using long-life LED illumination, ongoing compliance with electrical and ecological norms and standards, and through our own technological platform, Scan2Net® - a recognized standard for reliability, flexibility and ease of use. Fine Art scanners for non contact overhead scanning of 36 x 60"
Image Access has a large, highly qualified staff; the majority of whom are hardware, software and production engineers who put quality as their top priority - from the first idea for a new product, through development, series manufacturing, delivery to customers and what´s most important, after-sales service and support. An Image Access scanner at a customer location can be easily kept up to date with the latest hardware and firmware without ever having to move it.